Burning Chair vs. Burning Man? 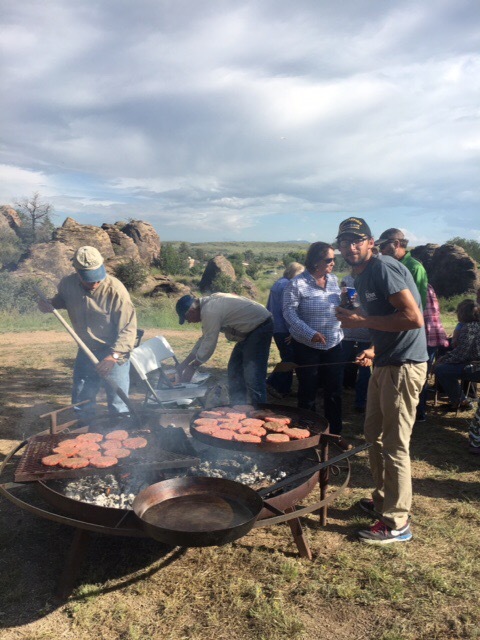 It was a perfect Fort Davis afternoon when we gathered in the shadow of Sleeping Lion Mountain for a Labor Day cook-out at the home of Tammy and James King. James and his friend David Hedges mowed an area beneath the mountain for the “party zone” and set up the sun shelter, tables, chairs and a massive firepit. Beverages and burgers with all the fixins were provided by our gracious hosts, and the food table was filled with potluck dishes to share. The potluck dishes included homemade corn pudding, potato salad, hominy salad, seasoned beans, fruit salad, watermelon salad, chicken tamales with guacamole and salsa from the Marfa Lights Festival, a cheese platter, a pickled platter with olives, pickles and pickled okra, and brownies for dessert. The beverage table included everything from rum to Sotol (state drink of Chihuahua and similar to mescal), beer, wine, grapefruit vodka punch, and Topo Chico sparkling water. There was more food than we all could’ve eaten. The guys cooked big, fat burgers on the firepit grill. The Kings know how to throw a party. 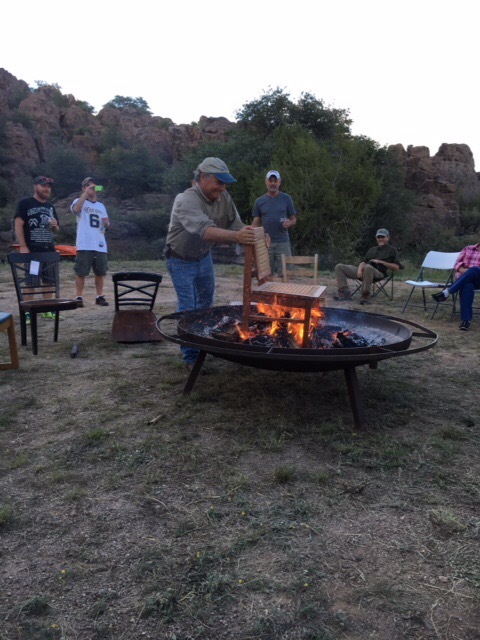 Throughout the evening, people were encouraged to sit in one of the four broken chairs placed near the firepit – one was missing one leg, another was missing two legs, and the others were ratty in their own ways. The idea was to sit in the chairs, let your negative energy be released into the chair, and then burn the chairs, along with your negative vibes. Or so we were told. We all took turns sitting in the broken chairs before they were burned in the firepit. Once the sun started going down, Pete Szilagyi, interim general manager of Marfa Public Radio and hiking enthusiast, told us a story about a hiking trip he and some other Fort Davis folks had taken to Utah. The short story is that one of them sat in a very minimally-designed Scandinavian chair while sitting around the fire one night. The chair collapsed, the man fell to the ground, and he then picked up the broken chair pieces and threw them in the fire. And so began the Burning Chair tradition. Not only did we burn four chairs, we burned a painting that had been relegated to the garage because, as we were told, “My wife has never liked it.” We all cheered when the chairs and the painting were gobbled up by flames. Burning Man, a week-long festival in the Nevada desert that concludes with the burning of a huge effigy that varies year to year, just happened to be going on at the same time we held Burning Chair in Fort Davis. I have a feeling Burning Chair in the high desert of West Texas was much more pleasant than Burning Man in the arid, dusty Nevada desert. Have all of your ingredients ready for burger assembly. Smear guacamole on one bun, refried beans on the other bun. Add onions and crushed chips to one of the buns so that it is held in place, then add your cheesy burger patty and top with salsa before putting the top bun in place.